As part of our extensive array of products, BS Stainless supply steel toggles and latches for use in a wide variety of applications made from stainless steel, Aluminium or Galvanised (zinc coated). Guaranteed to provide strength and security, our toggles and latches are manufactured to the highest quality specifi­cations and are supplied to our worldwide customer base. Steel toggle and latches are widely used within the power generation industry oil, gas, electricity, nuclear especially in grade 316 / 1.4404 stainless steel. There most popular use is for securing covers, lids and valve boxes. Stainless steel toggle latches are usually secured using rivets to fasten them into sheet metal. The types of toggle will depend on the strength required, the size, the type of access and the corrosion or fire resistance. The terminology used to describe toggle can vary significantly from county to county and by industry. Within the insulation industry it’s common to describe them by size as 1”, 2” toggles or similar, some clients will just refer to them as small, medium or large others will have a specific drawing to match or a product referance or brand name we have a large stock range to offer over 100 variations. Our standard toggles are manufactured to the highest standard with a product range of over 40 styles mainly in stainless steel but also in aluminium and zinc plated or galvanized steel. 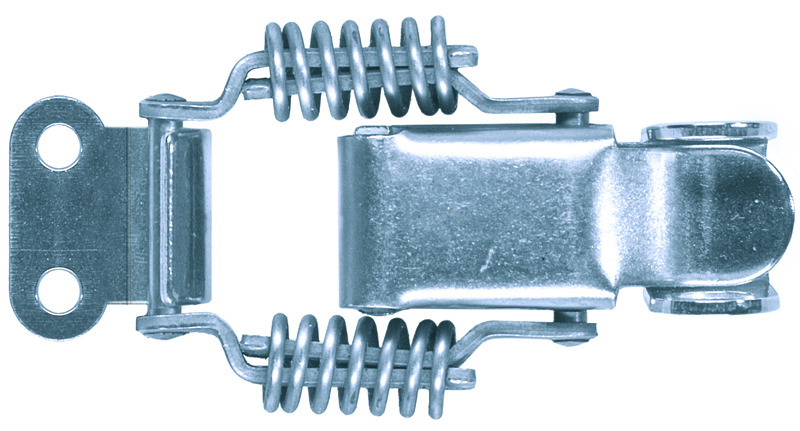 Our toggles can be supplied as quick release or with springs and locking device. Toggles are widely used in the oil and gas industry both on and offshore, we have a new range of toggles that are used for securing fire jet boxes for safety these include a cotter pin that cannot be misplaced due to a revolutionary safety device. These toggles are designed to achieve the high tensile strengths of NORSOK standard and they easily exceed these levels. Our toggles are produced to meet many international standards of CINI, SHELL, NORSOK and to CE standards along with certification ASTM A167/A240 Produced in grades 304 /1.4301 and 316 / 1.4401 as standard we can also supply in Duplex, all our toggles are x-ray tested prior to shipping to ensure all components are approved . Stainless steel toggles are fire resistant and 100% recyclable. Stainless steel rivets for industrial insulation applications and metal jacketing.